Verticordias are an outstanding Australian Plant used widely in the cut flower trade. Verticordia plumosa is a favorite variety with beautiful pink flowers. Now available in grafted forms which make Verticordias more suitable for the home garden especially in the eastern states. 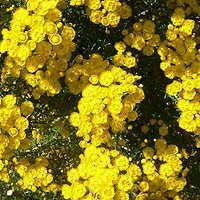 Coming in a range of colors from the yellow of Verticordia chrysantha through to red these plants are well worth trying in pots. Verticordia chrysostachys (pictured right) is widely grown for its lovely yellow flowers. A fantastic group of colorful flowering plants the feathery flowers of the all species are long lasting and add a real splash of color to any garden. V. pritzelii has beautiful dark pink flowers while V. pennigera has lighter pink flowers. V. grandiflora has flowers of a golden color. V. grandis or ‘Scarlet feather flower’ has deep red flowers befitting its common name. In terms of growing conditions and care all Verticordia require an extremely well drained soil, it seems that varieties grafted onto rootstock of hardier relatives such as Darwinia citriodora are better suited for the home garden. V.drummondii, V. fragrans, V. etheliana, V. insignis, V. mitchelliana, V. monadelpha or ‘woolly feather flower’, V. nitens, V.nobilis, V. oculata and V. tumida are other species worth considering, all are rewarding, but remember the grafted species of Verticordia are a little more forgiving.